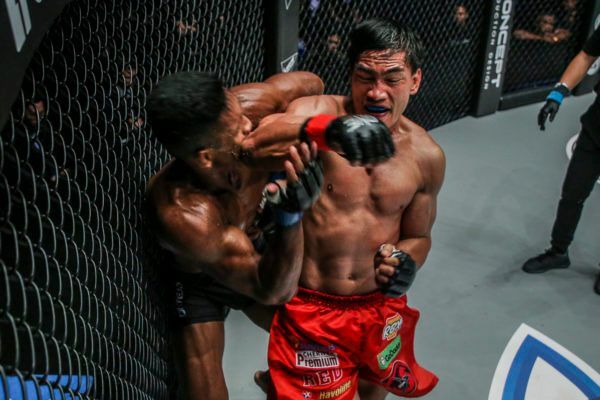 Friday, 23 November, was a landmark day for Eduard “Landslide” Folayang. It was the night the Team Lakay star reclaimed the ONE Lightweight World Title at ONE: CONQUEST OF CHAMPIONS in Manila, Philippines, as he returned to the top of the world after spending a full year battling his way back to the belt. For Folayang, the win was a product of two key factors – shrewd game planning, and the support of the most in-form mixed martial arts team in the world. “Our game plan was to punish him when he switched stances, and score as much as I could in the clinch. At the same time, avoid his left kick and his strong left hand,” he explains. Folayang reveals they had also planned to use takedowns as an integral part of their strategy, but after feeling that Khan was waiting for him to change levels, he instead chose to adapt his approach on the fly, and keep the bout on the feet. “We had plans to take him down, but eventually we figured out that he was also waiting for that opportunity. That’s why we didn’t focus on that strategy that much, and just stuck with our original game plan,” Folayang says. “We were able to predict the things he presented inside the cage, as well as the techniques and the strategy that he wanted to impose. Luckily, I was able to stop all those attempts. 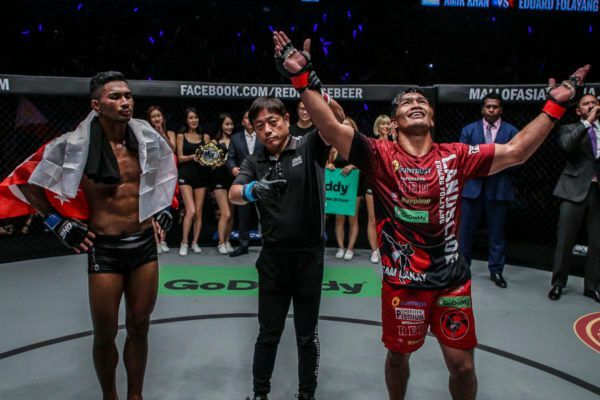 Hear from Eduard Folayang right after his epic World Championship win over Amir Khan! Folayang’s triumph saw him complete an incredible year for his team. Baguio City’s humble Team Lakay has captured an incredible four ONE World Titles in 2018. Geje “Gravity” Eustaquo, Joshua “The Passion” Pacio, and Kevin “The Silencer” Belingon successfully took the flyweight strawweight, and bantamweight crowns, respectively. Folayang paid tribute to his teammates, as well as the collective’s head coach Mark Sangiao, for his return to the lightweight summit. “We have a good team, a good coach, and brilliant people who support us,” he said. Folayang first won the World Title as a huge underdog, when he defeated Shinya “Tobikan Judan” Aoki to become the ONE Lightweight World Champion. 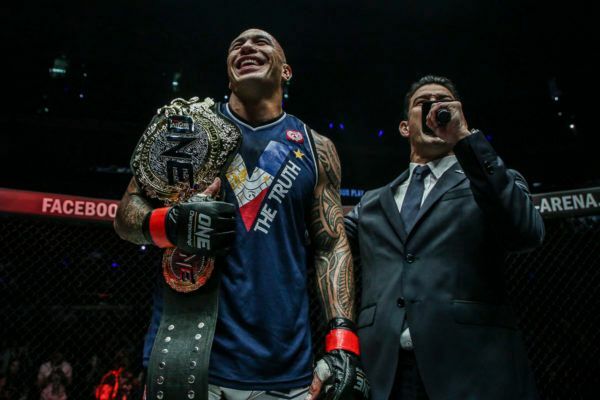 After losing his belt in 2017, the Filipino superstar went back to the drawing board, before clawing his way back into contention by defeating two unbeaten Russian powerhouses. Now, he has captured the gold for a second time. After the first World Title win, Folayang put his belt around his coach Sangiao’s waist. He did exactly the same this time around. Eduard Folayang's backstage reaction to reclaiming ONE lightweight gold! “Landslide” says his mentor deserves a belt of his own, in recognition of the remarkable achievements Team Lakay has achieved under his tutelage. What's Next For The Winners At ONE: CONQUEST OF CHAMPIONS?